Andrea Filler (right) and Brooke Marquez regroup after fielding the ball. Filler leads the Wildcats in slugging percentage and is tied for first in home runs. Despite freezing temperatures, driving rain and rescheduled games, the Wildcats are making themselves quite comfortable at home in April. 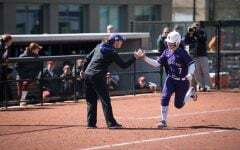 Northwestern’s weekend series with Nebraska (25-14, 6-5 Big Ten) marks its third straight weekend at home as part of a four-week span where the Cats (16-20, 7-4) play 13-of-15 games at Sharon J. Drysdale Field. 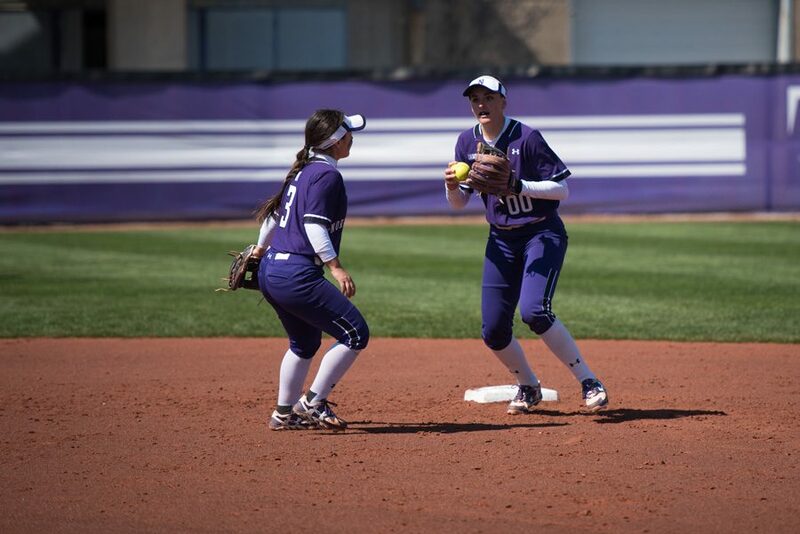 The lengthy homestand began April 1 against Minnesota in NU’s first home game of the season. 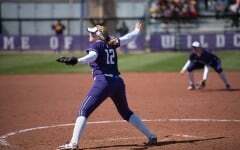 The Cats followed the three-game series against the Golden Gophers with another against Iowa. Michigan State will come to town next weekend and NU will play its final home game April 27 against local rival Loyola. After a non-conference schedule that involved five trips to warm weather destinations such as California and Florida, the Cats have not traveled as frequently. 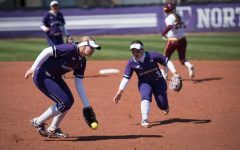 NU has not, and will not, leave Illinois for about a month-long period; its only road games during this stretch came in a doubleheader Wednesday against the Fighting Illini. The favorable schedule has also coincided with better results. NU struggled against a non-conference slate littered with high-quality opponents, finishing one California tournament 0-5 and playing poorly in others. Since returning to Evanston, however, the Cats have begun to reverse their fortunes. The series sweep of Iowa contributed to a six-game winning streak, NU’s longest of the season. The Cats didn’t win more than two in a row during non-conference play. Four games under .500 with 14 regular season contests to play, NU faces an uphill battle to return to the 64-team NCAA Tournament despite an RPI of 49. That number is buoyed by the Cats’ challenging non-conference schedule, which included seven games against ranked teams. NU’s schedule is somewhat peculiar in that its 13 home games all come in a relatively condensed stretch; the Cats will close the regular season with seven more games away from home. However, such a scheduling arrangement has some precedent. In 2013, NU went 8-4 in a stretch of 12 straight games played at home. Additionally in the Big Ten, Indiana also faces a similar schedule this year, playing 18 games in a 20-game stretch at home and not crossing state lines for over a month. Even with the run at home, the Cats’ schedule hasn’t gone off without a hitch. Poor weather forced a schedule tweak against Minnesota, and a game against Iowa was postponed because the field was too cold. Even when the weather cooperated enough to play, NU dealt with bitter cold and drizzle. None of that has bothered senior outfielder Fran Strub, who has hit .455 with six extra-base hits in 11 Big Ten games. Six of those games have been at home.